Iowa City-based artist Diego Lasansky has gifted more than 40 original intaglio prints of Martin Luther to Wartburg College in celebration of the 500th anniversary of the Protestant Reformation. Two prints will be kept by the college: one displayed on campus, the other at the president’s residence at Greenwood. President Darrel Colson has gifted the rest, along with a copy of Lasansky’s book cataloging his work from 2012 to 2015, to Lutheran colleges and organizations around the world. The print depicts Luther as Junker Jörg (translated to Knight George), the persona he adopted during his stay at Wartburg Castle, where he translated the New Testament from Greek into German. 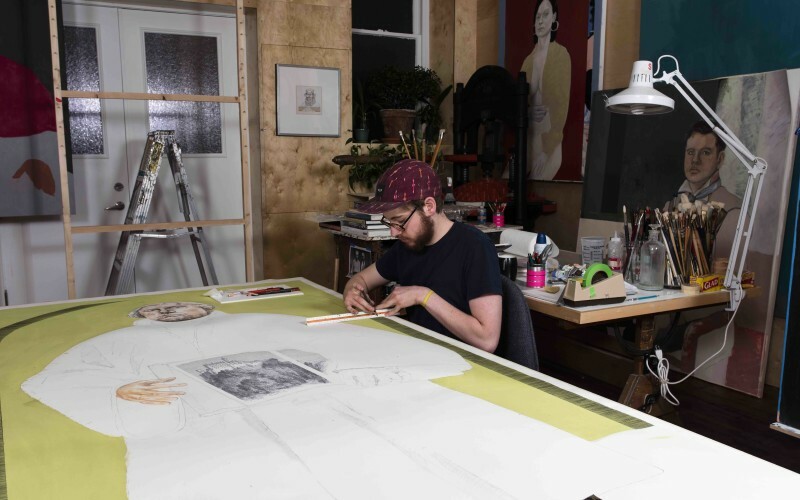 The collaboration began about four years ago when Colson saw one of Lasansky’s Martin Luther drawings. Originally, Colson thought the drawing would be a sufficient Reformation gift, but Lasansky wanted to think bigger. Each copy of Junker Jörg 1521 was created in Lasansky’s studio over a six-month period. The intaglio printmaking process involves etching and engraving on a flat piece of copper. Though Lasansky grew up nonreligious, he took great interest in the importance of religion throughout history and in art. This is not the only Lasansky piece on display on campus. Lasansky’s self-portrait and four prints created by his grandfather, famed Iowa artist Mauricio Lasansky, are installed on the third floor of Vogel Library. The elder Lasansky’s Holocaust-themed series, For An Eye An Eye, used the same copper printmaking process. “Diego’s print is a stunning example of skillful use of the artistic medium that his grandfather mastered. I cannot overstate the pleasure I’ve taken in watching Diego produce prints on the press that his grandfather used,” Colson said. The pieces all were donated by William Fruehling, a Waverly native who attended Wartburg for a short time before finishing his degree at the University of Iowa. Fruehling’s father, W.G., was the head of the college’s psychology department, and his mother, Marion, taught business classes and managed the bookstore.